It’s time to try out a new dessert on my hubby since my youngest is in college. Hubby has let it be known that he enjoys Pecan Pie. That was news to me because he usually raves about my mom’s apple pie and sometimes carrot cake. I learned through some prodding that hubby was first introduced to pecan pie at a restaurant he worked at as a teenager. It was a buffet style restaurant and pies that were not sold were often given to the employees to take home. Sweet Deal! Pun intended. Personally, I was never a big fan of pecan pie until now. I usually go for fruity pies like cherry, blueberry or my mom’s sweet potato pie. The one time I tried pecan pie as a kid I thought it was way too sweet. I blamed it on the pie but maybe it was just what the baker liked. Skillet Pecan Pie is not too sweet. Granted it is sweet but your lips will not pucker and your eyes won’t twitch from taking a bite of the pie. 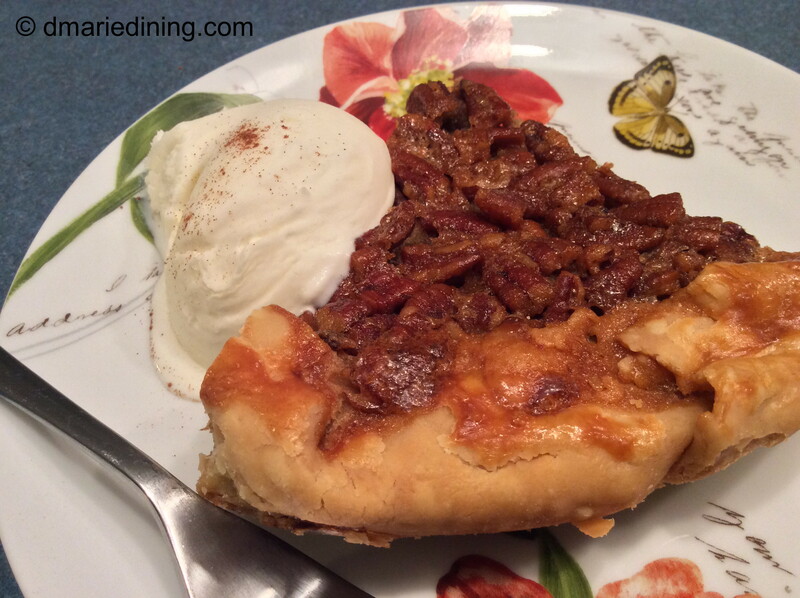 My Skillet Pecan Pie is similar to how I made my Skillet Apple Pie. The filling is of course different along with part of the process. After baking the pie, I leave it in the oven for an hour to help it set. I would never have known that part of the process if I had not read several pecan pie recipes to figure out exactly how to pull it all together. I was pretty pleased with the end result after a few tweaks here and there. Like any other recipe I share it is up to the chef to prepare the dish based on his or her likes and dislikes. I was just glad hubby gave me a thumbs up. 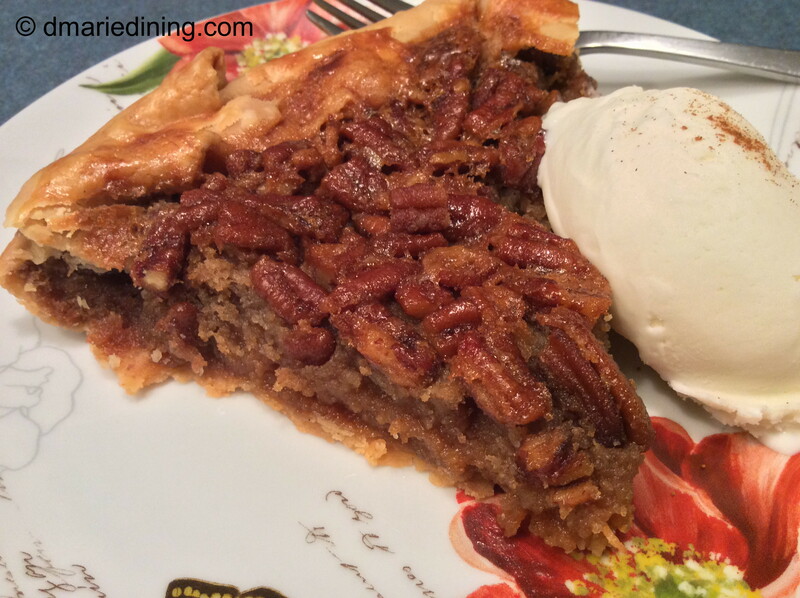 Once he settled down with a slice of pie, his cup of Starbucks coffee and a big smile on his face I knew my Skillet Pecan Pie was blog worthy. Whisk eggs until foamy then whisk in brown sugar, butter, flour, milk and vanilla until well blended. Stir in chopped pecans and set aside. Spray a medium sized cast iron skillet with cooking spray. 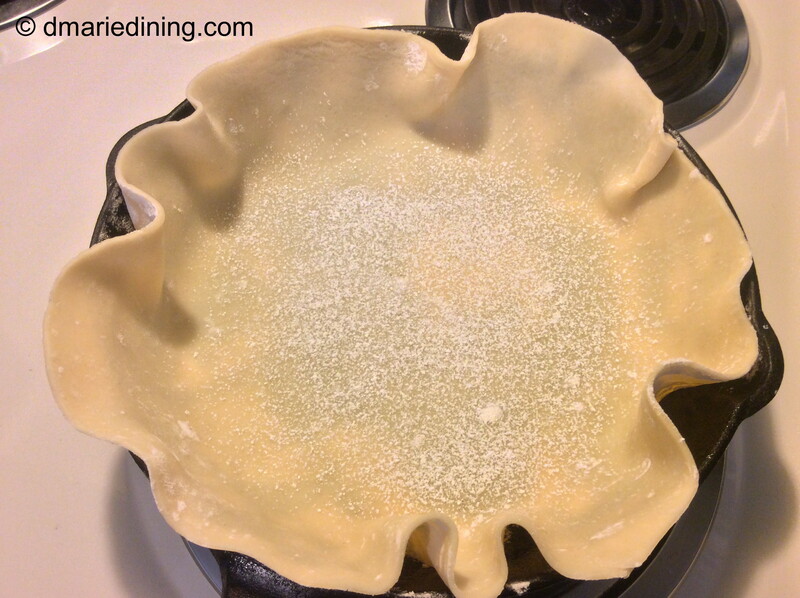 Mold pie crust into skillet leaving a little over hang. Sprinkle crust with powdered sugar. Pour filling into pie crust. 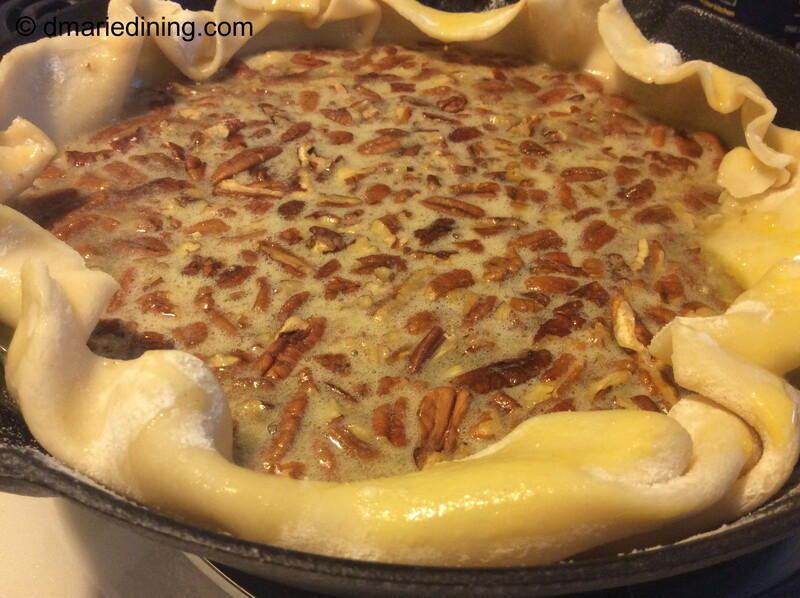 Top with pecan halves then gently fold the extra crust towards the center of the pie. Place on a cookie sheet and place in the oven. Bake for 30 minutes then reduce temperature to 300 degrees and bake 30 minutes more. Crust will be golden brown. Turn oven off and leave the pie in the oven for 1 hour. Serve with ice cream or whipped cream.